I have an excellent recipe for you, as well as a special treat for all of you Loki fans. Over spring break, my husband and I took our high school junior on a 5-day whirlwind tour of 6 colleges in Illinois, Ohio, and Indiana. We had excellent vegan food, especially in Chicago (Karyn’s on Green just rocks!) but one meal stands out as an unexpected treat. We were driving through Indianapolis after touring our last college, on our way back to Chicago to catch a 9pm flight home, and stopped at an all-vegetarian Indian restaurant called Spice Nation. We were just in time for the lunch buffet, where all the vegan dishes were helpfully labeled. I will be honest: We stuffed ourselves. Everything was so good, and it was a thrill to be able to eat at an Indian restaurant and not worry about butter or cream. 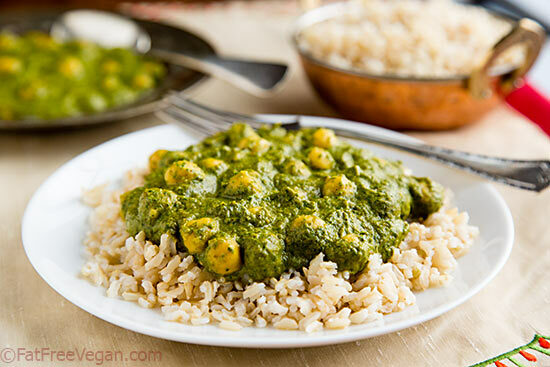 I think all of us would agree that our favorite dish was the one that was put out last, a creamed spinach with chickpeas similar to Palak Paneer but without the cheese. By the time the spinach dish was put out on the buffet, I was already so full that I could only have a small taste of it. Rich and creamy, it was hard to believe that it was vegan, but the staff assured us it truly was. I came home determined to replicate it at home. Of course, I had to be a little different, so I made my version with kale instead of spinach. But my family didn’t notice, and according to them, it’s as good as the original, which was definitely not low-fat. I used a few raw cashews for creaminess, but other than that, this rich, flavorful curry contains no oil, not even to temper the spices. I also used soy milk, but you can make it completely soy-free by using rice, almond, hemp, or coconut milk. And, of course, it’s naturally gluten-free. It was an instant family favorite both for its flavor and for how quick it is to prepare. Even using a bunch of kale that had to be washed, stemmed, and chopped, I was able to make this dish in under a half hour. If you use pre-chopped kale or spinach, you can make it even more quickly. Feel free to use other greens besides kale, whatever you have on-hand. Transfer blended mixture back to the skillet and bring to a simmer. Check seasonings and add more to taste. Stir in chickpeas and continue simmering about 10 minutes. Add salt to taste and serve over basmati rice. Toast lightly in a dry skillet over medium heat until fragrant (be careful not to burn). Remove from heat, cool, and grind in a coffee grinder or spice mill. Use immediately or seal tightly and store in a dark place away from heat. Makes about 2 tablespoons. Greetings, this dish sounds amazing while being so simple to make (my favorite kinds of recipes), however, I am not a fan of tomatoe paste, if this a key ingredient in the dish? If so, is there an alternative, or do you know if it would be just as good with fresh tomatoes? here’s to a good recovery. Hi Susan! I’m so glad I found this recipe! I had some kale leftover and wanted to use it up. This was a tasty solution to the problem and it’s going to be hitting our table regularly. Thank you! Thank you for this recipe. Just tried it tonight and it was just great. Yum! So glad I stumbled over this recipe. Made it this morning and it is soooo good! 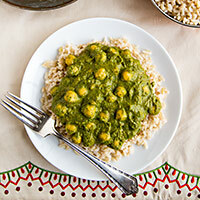 I often sprout chickpeas, this is a great recipe to add my sprouted chickpeas to. Thank you so much for sharing this delicious recipe. Made this tonight, and it was seriously amazing. I likely will up the Ginger and heat next time; but the flavor was perfect. My first real try at Indian food. Thanks Susan! Thank you for sharing your loki videos… I am still smiling. FINALLY got around to making this dish the other day and it was an instant hit (so typical of your recipes!) We didn’t change a thing about it and don’t feel any need to, though I see some interesting suggestions for additions in your comments. We had very little leftover (and there are only 2 of us! We gorged! ), but what was left was delicious wrapped in whole wheat tortillas the next day. Thank you for another wonderful, healthy, easy recipe! I made this yesterday and loved it over brown rice. I cut back on the “heat” a bit. Fantastic. Great recipe! It looks like millions of calories, and it’s my little secret that it’s actually quite healthy! This recipe is a favorite that I make often!! Just made this, and it is AMAZING! SO flavourful and filling. I’m putting this in regular rotation, for sure. Even my carnivore husband loves it. Thank you! Thank you, Katie! This is one of those recipes that I wish everyone would try. This meal has become one my favorites, I simply love it, made it many times 😊 Thanks for sharing your great taste in food with us! I tried this last night with green beans. It was delicious. My daughter doesn’t like spicy so I’ll add less pepper to the whole recipe. We really enjoyed it! I just love this recipe! It’s so easy to put together and it makes such a delicious and satisfying meal! This is an ammmmmmaazzzing curry! Especially because it negates the natural bitterness of kale. Kale was the only yhing we could grow in our natural garden soil so I have used this so many times ober the years. I searched for this once again because I want to try it with my 2 year old! Made this and absolutely loved it! I am making a second batch of the sauce today to use without the chickpeas over baked potatoes. 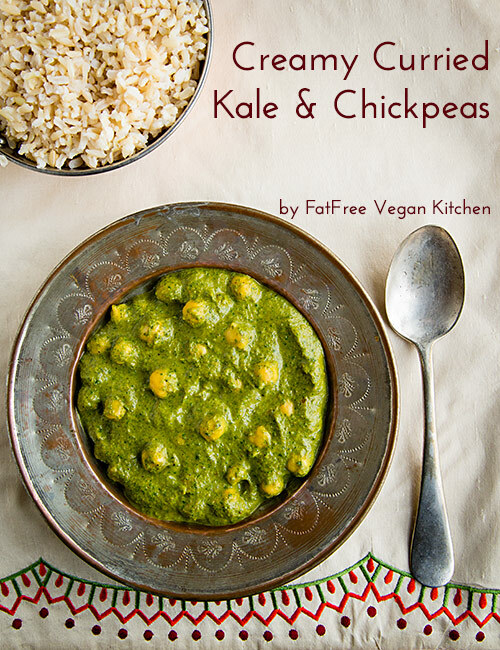 I can see this will be a great way to up my kale intake and plan to make it often. I am trying the I-Pot this time just to see how it does.